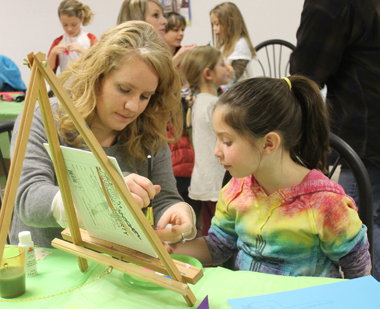 Above, Sophie Kitchen, a first-grader at Yeso Elementary School, and her mother, Crystal Kitchen, paint a blue snowflake during the Girl Scouts of the Desert Southwest’s Mother-Daughter Craft Night Friday. 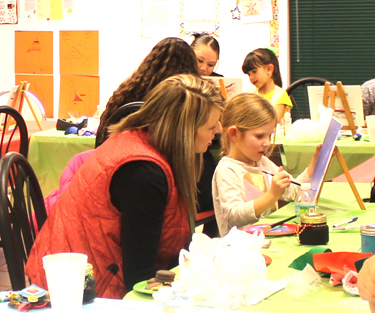 At right, Maci Peck, 4, and her mother, Brittany Peck, work together painting a picture, Maci said, of “Mommy.” The Girl Scouts are actively seeking members in grades K-12 as well as troop leaders and adult volunteers. For more information, contact Maria Landrie at 746-9846 or 703-5006. 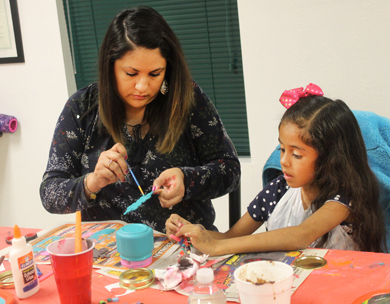 Below, Colette Marrufo, an Owl at Grand Heights Early Childhood Center, and her mother, Ciarra, contemplate the next step to take on their painting of a snowy winter scene.